In 2016 the British act Multi Story returned to the progressive rock scene after a hiatus of after almost 30 years. Multi-Story made with Crimson Stone (see review) a strong comeback album. I wrote in my review that on this album you will find a kind of nostalgia which is served with melodic neo progressive rock of the old school. With hints to the music made by IQ, Magnum, Pendragon, Pallas and early Marillion back in the eighties. 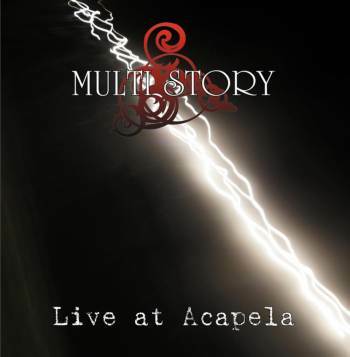 Now one and a half years later, Live At Acapela is released, a double CD recorded during the "Crimson Stone" tour. Luckily enough for me a review copy was sent to the Background Magazine office. So I could also give my verdict on how the band sounds on a live stage! Well right from the start it becomes very much clear to me, that this band managed to reproduce their sometimes complex music the best possible way in front of an audience. The music that you hear is almost always carried by majesty and influenced by the rich keyboard instruments played by Rob Wilsher. The drums played by Jordan Neale rumble and the bass played by Kyle Jones pumps. Now and then the guitar handled by Aedan Neale may provide for slightly rougher sounds, but never gets towards a heavy metal sound. Finally lead singer Paul Ford reproduces his vocal lines as they are on the albums on which he sang. The music performed during the concerts always stays strong and this brings me to the moment to tell you what they had on their setlist. You can enjoy five titles of their debut East West (1985). Bringing back the memories of the time I played this album so much and loved it all the way through. Three tracks are surprisingly also taken from the rather unsuccessful 1987 album Through Your Eyes, on which only original member Rob Wilsher is represented, there the singer Paul Ford had been replaced by a certain Grantley Nicholas. Hearing them now shows why they are still on the setlist nowadays. They certainly have something to tell music wise! Even done in an almost complete new line up! Finally I can tell you that almost the entire earlier mentioned Crimson Stone album was done on stage. Six of the eight tracks on the album can be enjoyed in full splendour! Telling me once again why I enjoyed their comeback album almost as much as their debut released long ago. Live At Acapela is a wonderful double live album recorded in their native Wales. It captivates perfectly how the band acts nowadays, mainly thanks to the intimate atmosphere you can hear throughout the entire concert. This live album is sure to make fans of Multi Story very happy. After listening to this release they will want to get out to watch them with their own two eyes and hear how amazing they sound during live concerts. Because that's what they are. An amazing live act! Judge for yourself and conclude I was right after all!